It’s not my strategy to leave pictures sitting on my desktop so long I forget where they come from, and then I don’t have to credit them or worry about posting them. If if were, I’d start a tumblr. 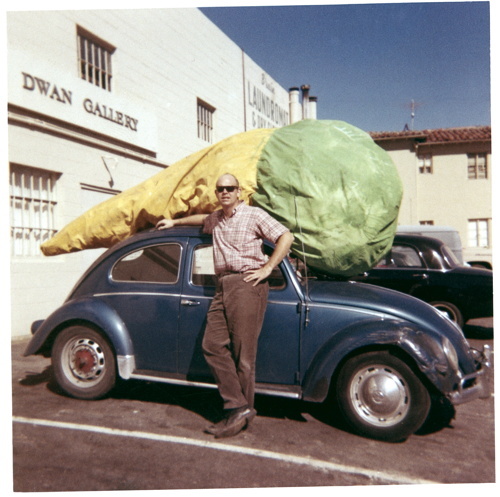 Given the amount of attention I’ve paid to various artists’ Volkswagens, I honestly thought I’d be writing something more extensive about Claes Oldenburg wheeling up to the Dwan Gallery with the giant Floor Cone Peggy sewed for him strapped on top of his car. But not yet. And anyway, it’s been making the rounds, but I’m guessing it came from researching Sturtevant and Dwan Gallery a few months ago, and finding it on ArtObserved.